(GRAB-BAG OF AIPAC-SUPPORTED MIDEAST BILLS, INCLUDING BILL ENCOURAGING/SUPPORTING UNCONSTITUTIONAL STATE ANTI-BOYCOTT LAWS) S. 1: Introduced 1/3 by Rubio (R-FL), Risch (R-ID), Gardner (R-CO), and McConnell (R-KY), the “Strengthening America’s Security in the Middle East Act of 2019 (SASME).” The sponsors’ press release announcing the bill is here. Full details of the bill and the battle surrounding it are in Section 2, below. (HOUSE COMPANION TO S. 1) HR 336: Introduced 1/8 by McCaul (R-TX) – the new ranking member of the House Foreign Affairs Committee – along with McHenry (R-NC) and Hurd (R-TX), “To make improvements to certain defense and security assistance provisions and to authorize the appropriation of funds to Israel, to reauthorize the United States-Jordan Defense Cooperation Act of 2015, and to halt the wholesale slaughter of the Syrian people, and for other purposes.” This is explicitly framed as a companion to S. 1. Referred to the Committees on Foreign Affairs; the Judiciary; Financial Services; Science, Space, and Technology; and Armed Services. NOTE: No text is available as yet for this bill, so it is not clear if it includes the Combating BDS Act (odds are good that it does). (FY19 CONSOLIDATED APPROPS) HR 21: Introduced 1/3 by Lowey (D-NY), the “Consolidated Appropriations Act, 2019.” Passed by the House 1/3 by a vote of 241-190, with all Democrats and 7 Republicans voting “yes,” and 190 Republicans voting “no,” and sent to the Senate, which has not taken it up as of this writing. This bill includes all the outstanding appropriations bills that were not passed in the last Congress (leading to the partial government shutdown). It includes the entire FY29 State and Foreign Operations Appropriations bill, including various perennial Israel/Mideast provisions, earmarks for Israel aid, etc. It also includes a provision entitled, "PRIVATE SECTOR PARTNERSHIP PROGRAMS,” adapted from last Congress’s HR 5760 and S. 3549. Stay tuned for a full analysis of the Middle East-related provisions. (NO AID IF YOU DON’T SUPPORT US & ISRAEL AT THE UN) HR 28: Introduced 1/3 by Gohmert (R-TX) and no cosponsors, the “United Nations Voting Accountability Act of 2019.” Referred to the House Committee on Foreign Affairs. This is something Gohmert has been trying to do for years (this is at least the 8th iteration of the bill), and it is an effort closely connected to UN votes on Israel (for more background, see here). (ALL OF JERUSALEM, ESPECIALLY CITY OF DAVID/SILWAN, BELONG TO ISRAEL) H. Res. 12: Introduced 1/3 by Wilson (R-SC) and no cosponsors, “Affirming the historical connection of the Jewish people to the ancient and sacred city of Jerusalem and condemning efforts at the United Nations Educational, Scientific, and Cultural Organization (UNESCO) to deny Judaism's millennia-old historical, religious, and cultural ties to Jerusalem.” Referred to the House Committee on Foreign Affairs. Wilson tweeted on his resolution, here; his press release is here. (MORE IRAN SANCTIONS) HR 194: Introduced 1/3 by McCaul (R-TX) and no cosponsors, “To impose additional sanctions with respect to serious human rights abuses of the Government of Iran, and for other purposes.” Referred to the Committees on Foreign Affairs; Judiciary; Financial Services; and Ways and Means. (GLOBAL ANTI-SEMITISM) HR 221: Introduced 1/3 by Smith (R-NJ) and having 85 bipartisan cospsonsors, the “Special Envoy to Monitor and Combat Anti-Semitism Act.” Brought to the floor under suspension of the rules 1/10 and passed on 1/11. NOTE: While HR 221 does not mention Israel or BDS, Smith is making clear that it is very much about both. In a 1/10 floor statement he noted that, the “Special Envoy to Monitor and Combat Anti-Semitism Act,” citing Natan Sharansky’s 3 Ds “demonization, double-standard, and delegitimization” and noting that the “so-called BDS movement to boycott, divest from, and sanction Israel is one of the most pernicious examples of what Sharansky called the new anti-Semitism.” Likewise, his press releases touting introduction and passage of the bill highlighted the “3 Ds” framing for defining anti-Semitism. (US CITIZEN DETAINED IN SYRIA) H Res 17: Introduced 1/3 by Green (D-TX), “Expressing concern over the detention of Austin Tice, and for other purposes.” Referred to the Committee on Foreign Affairs, and in addition to the Committee on Intelligence. (US POLICY ON SYRIA) HR 31: Introduced 1/3 by Engel (D-NY) and having 50 bipartisan cosponsors, the “Caesar Syria Civilian Protection Act of 2019.” Referred to the Committees on Foreign Affairs; Financial Services; and the Judiciary. NOTE: This is one of the bills includes in S. 1. (US POLICY ON SYRIA) S. 52: Introduced 1/8 by Risch (R-ID), Menendez (D-NJ) and Rubio (R-FL), “A bill to halt the wholesale slaughter of the Syrian people, encourage a negotiated political settlement, and hold Syrian human rights abusers accountable for their crimes. Referred to the Committee on Foreign Relations. (RECOGNIZE GOLAN AS ISRAEL’S) Lamborn-Perry letter to Pompeo: On 12/21/18, Reps. Lamborn (R-CO) and Perry (R-PA) led a letter, cosigned by 17 GOP colleagues, sent to SecState Pompeo, urging that the U.S. recognize Israeli sovereignty over the Golan Heights. Lamborn press release is here. As most people know, in the midst of what is set to be the longest government shutdown in U.S. history, Senate GOP leaders decided that the best way to start the 116th session of the Senate was to push a bill consisting of a grab-bag of Israel- and Middle East-related measures. That bill is S. 1, named the “Strengthening America’s Security in the Middle East Act of 2019 (SASME).” The sponsors’ press release announcing the bill is here. Floor consideration/votes: As of this writing, GOP leader McConnell (R-KY) has sought cloture (requiring 60 votes in favor) on the bill twice – once on January 8 and once on January 11th (representing the first 1 votes of the new Senate). A third cloture vote is scheduled for 5:30pm on January 14th. The first vote was 56-44, with “yes” votes from all GOP Senators (except, for some reason, McConnell, according to the official vote count) plus four Democrats -- Jones (D-AL), Manchin (D-WV), Menendez (D-NJ) and Sinema (D-AZ). The second vote was 53-43, with all GOP senators voting “yes,” except for four who didn’t vote [Cornyn (R-TX), Cruz (R-TX), Moran (R-KS), and Perdue (R-GA)], along with the same 4 Democrats. What’s in S. 1, anyway? S. 1 consists of four measures previously introduced in past sessions of Congress: (1) the United States-Israel Security Authorization Assistance Act; (2) the United States-Jordan Defense Cooperation Extension Act; (3) the Caesar Syria Civilian Protection Act; and (4) the Combatting BDS Act. For a run-down on the legislative history of all of these measures, the Congressional Research Service has published a helpful guide, here. Of those measures, the last is the focus of serious controversy, as it is designed to give political cover to state bills – already declared unconstitutional by two federal courts – that seek to force businesses and individuals (the latter in their capacities as sole proprietors of businesses or independent contractors) to affirmatively give up their right to free speech when it comes to Israel as a condition for working with states. My full analysis of the Combating BDS Act – from when it was originally introduce – is here. The ACLU has come out repeatedly in opposition to the Combating BDS Act (on its own and as part of S. 1) – for all those statements, see here. For a compendium of resources on the constitutional issues with the state bills, see here. For a Twitter thread with links on the court challenges to those state bills (so far), see here. BDS Battle Overshadows Free Speech Issues: Regrettably, much if not most of the media coverage of S. 1 seems to focus on BDS controversy & downplay free speech issue. This is irresponsible. As I laid out here, the free speech exception politicians are backing for Israel is creating a template for a broader assault on the 1st Amendment. Advocates of the Combating BDS Act have long dismissed or downplayed the First Amendment issues at stake. At the same time, GOP Senators appear to be using S. 1 as a tool to try to shift debate away from the government shutdown and turn it into a fight over which party is more pro-Israel. In effect, they are trying to turn S. 1, and the Combating BDS Act in particular, into a referendum on BDS and into a pass-fail test of support for Israel. The AIPAC factor: Despite the very partisan coloration of S. 1 – its all-GOP sponsorship, its timing to distract from the government shutdown, the GOP narrative of using the bill to undermine Democrats’ pro-Israel bona fides -- AIPAC has decided to jumped into this battle with both feet. AIPAC has come out in support of S. 1. After Sen. Rubio suggested in a tweet that Democrats were opposing the bill because most of them now support BDS (a suggestion that is manifestly false) AIPAC declined to comment. 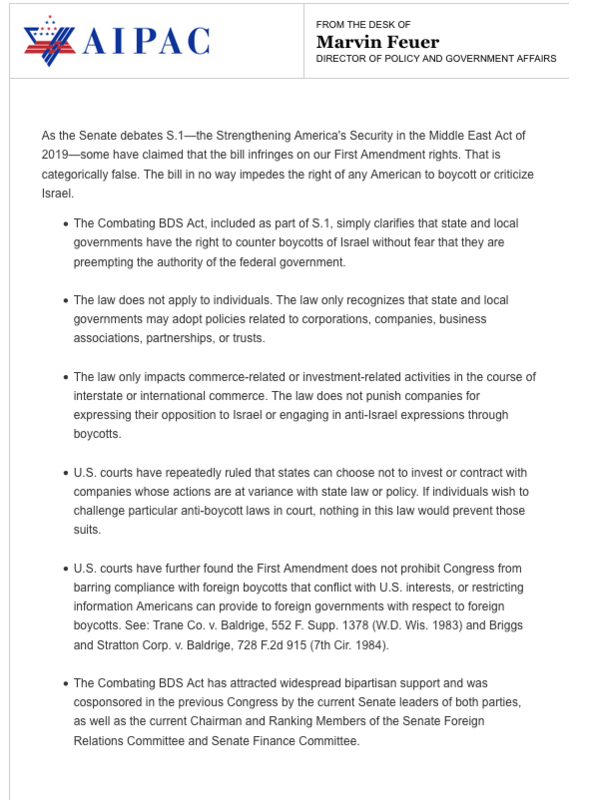 This week was actively trying to sell Combating BDS Act, including in a fact sheet-style memo circulated to members of Congress (which it posted online in a slightly different format on 1/11). 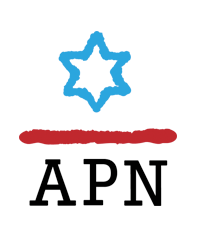 How good are AIPAC’s facts about the bill? I examine them, point by point, here. “Mr. President today I rise in opposition to S. 1. We should be working to reopen the Federal Government, not voting to infringe upon Americans' First Amendment rights. “S. 1 is a package of four bills that were introduced during the last Congress. Three of the bills concern U.S. aid to Israel and Jordan, as well as sanctions against the Assad regime. They are noncontroversial, and I support them. Unfortunately, the fourth bill, which is entitled the ‘Combatting BDS Act of 2019,' is so controversial that I am compelled to vote against the entire package before us tonight. “This Israel boycott legislation would encourage States and localities to restrict First Amendment protections for millions of Americans. It would do so by tacitly endorsing State actions to cut financial ties and terminate any government contract with anyone who engages in or supports boycotts of Israel. “My grandfather arrived in the United States as a stowaway fleeing the Polish pogroms, and my grandmother's family fled Russia during the revolution. As a young child during World War II, I came to view Israel as a symbol that never again will there be another Holocaust. My support for Israel isn't about politics. It is about Israel's right to exist. “I will always support a free and democratic Israel as the homeland of the Jewish people. That is why I have always voted to provide Israel the security assistance it needs. However, my unwavering support for Israel does not override my support for Americans' constitutional rights. “The right to free speech is the foundation of American democracy. Any legislation that encroaches on that foundation should be considered with great caution. I don't believe that has been the case here. Federal courts have already ruled against similar laws regarding boycotts of Israel enacted by Arizona and Kansas. “In Kansas, the State legislature passed a law in 2017 requiring any individual or company that contracts with the State sign a certification that they are not participating in a boycott of Israel. In Arizona, State law requires any company that contracts with the State to certify that it is not engaged in a boycott of Israel and that it will not do so in the future. “Federal courts in both States found that these laws raised substantial First Amendment concerns by infringing on individuals' right to political expression and issued preliminary injunctions blocking their enforcement. Given the courts' rulings in Arizona and Kansas, I fail to see why supporters believe this legislation can be considered constitutional. “Equally alarming, the legislation would also apply to Israeli settlements in the West Bank, territory that Israel has never claimed as its own. Today, there are more than 400,000 Israelis living on 132 settlements in the West Bank. Since President Trump took office, the Netanyahu government has accelerated the expansion of existing settlements, created new settlements and outposts, and taken steps to retroactively legalize settlements built on private Palestinian land. “Enacting legislation to stifle criticism of settlements on land beyond Israel's borders would set a dangerous precedent that would further erode our credibility as a neutral arbiter in the Middle East conflict.